A tale from the Brothers Grimm provides inspiration for three gifted students from the world-renowned Art Center College of Design in Pasadena, California. Khang Le, Mike Yamada, and Felix Yoon were guided by their instructor, Scott Robertson, to create original design solutions for the environments, characters, props, and vehicles found within The Skillful Huntsman. The trio’s sketches and full-color renderings thoroughly document the creative process of concept design, revealing a host of intriguing places—from sci-fi cities to castles, and people—from giants to royalty. 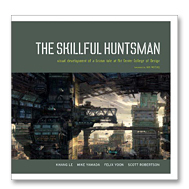 A must for artists, aspiring entertainment designers, comic aficionados, and anyone interested in the creative process, The Skillful Huntsman offers insight into the mysterious world of the imagination.